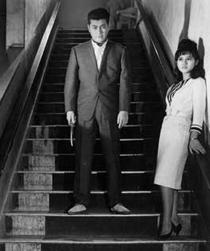 Overview - In this cool, seductive jewel of the Japanese New Wave, a yakuza, fresh out of prison, becomes entangled with a beautiful yet enigmatic gambling addict; what at first seems a redemptive relationship ends up leading him further down the criminal path. Bewitchingly shot and edited and laced with a fever-dream-like score by Toru Takemitsu (Woman in the Dunes, Ran), this breakthrough gangster romance from Masahiro Shinoda (Samurai Spy, Double Suicide) announced an idiosyncratic major filmmaking talent. The pitch-black Pale Flower (Kawaita hana) is an unforgettable excursion into the underworld. Cast in the perpetual, noir coated shadow of the sordid, seamy world of professional crime, Masahiro Shinoda's Japanese New Wave film 'Pale Flower' explores the fragility of innocent love and passion among stronger desires for thrills and dark dangers. Backed by an original and quite inventive use of sound, and a discordant, uneasy score, Shinoda's visuals move to a strong and powerful rhythm. Unfortunately, while these stylistic choices carry artistic merit, the movie's narrative never comes together in as meaningful or deep a manner as it aspires to. 'Pale Flower' follows a gangster named Muraki (Ryô Ikebe) as he is released from prison and returns to the seedy underworld of Japan. While visiting a gambling parlor, he becomes fixated on a young woman named Saeko (Mariko Kaga) who thrusts herself into the illegal world of gaming as a means to escape the boredom of everyday life. The two soon forge a connection born out of their shared listless wandering, but things take a complicated turn when Saeko heads down a potential path of self destruction and violence breaks out within the gang world. The story itself is rather simple, but mostly effective. Ikebe brings a sort of doomed malaise to the recently freed gangster, unsure how to proceed in life and Kaga expertly contrasts her outward innocent appearance with a darkly playful thirst for danger that lurks just below the surface. Director Masahiro Shinoda and composer Toru Takemitsu have together formed an inventive and at times quite striking marriage of image and sound. The gambling scenes themselves are a perfect example. Through close-ups of cards shuffling and various reaction shots of ambiguous glances, the images form a collective montage of minutia and tension, demonstrating the strategy and intricacies of the game. Bolstered by the unique sound design, which creates an uncomfortable and intensifying rhythm out of simple sounds like the sharp tapping of cards, an incredibly tense and artful balance is forged. This all brings a certain level of excitement to an event that in lesser hands may have come across as tedious and uninteresting. Though I still have no idea what was going on in the actual card game (in fact, the seemingly complicated and intricate rituals involved reminded me of a similarly incomprehensible game Barney played with a few Chinese business men in an episode of 'How I Met Your Mother') as film scholar Peter Grilli points out in the included commentary, the editing, sound design, and score weave a narrative of their own, clueing the audience in on the major beats and developments. Similar techniques are carried over into other scenes with the dissonant and harsh music cues forming an uneasy but impactful union with the images. The climax of the film is also particularly noteworthy, taking a different approach by using a traditional classical composition that is made all the more potent by its heavy contrast with what preceded. While the style is certainly striking, the film never really comes together as well as one would hope. Though the performances are strong, and there are certainly meaningful thematic parallels to be drawn between the characters' existential woes and Japanese culture and society during the Cold War, ultimately, the narrative isn't as deep or fleshed out as it aspires to be. Likewise, certain scenes, including the artfully shot gambling sequences, tend to drag on a bit. While the character of Muraki is intentionally detached, this approach makes it hard for the audience to really form any kind of connection to his journey. The closing of the film worked on an intellectual level, evoking a tragic never ending hunger for passion, but the film's somewhat removed style robbed it of any actual emotional weight. All these elements lead to an unsatisfying and occasionally uninvolving story. In the end, 'Pale Flower' is an interesting example of sight and sound finding a meaningful harmony and disharmony through composition, editing, and innovative scoring. The story itself is well acted, but its thematic beats and deeper subtext don't always connect as well as intended. Still, it is an artfully constructed film that is certainly worthy of a look. 'Pale Flower' is presented in a black and white 1080p/AVC transfer in the 2.35:1 aspect ratio. While occasionally impressive, there are some issues which leave a bit to be desired. The source itself is in great shape, with no apparent signs of damage or age. A light layer of grain is present throughout. Detail is fairly strong, though some shots appear a bit softer than others. At its best, there are some truly impressive instances of dimensionality, giving a deep and textured quality to the image. The transfer isn't perfect however, with the main weakness being inconsistent and occasionally elevated black levels. Instead of a deep, inky tone, we are sometimes treated with a slightly milky gray shade. While this issue may simply be inherent to the source, it still leads to a somewhat washed out and faded presentation. On the other hand, in lighter scenes or when blacks do appear more deep, contrast is very strong, leading to whites which pop off of the screen with bright intensity. While there are many strengths to the video here, the inconsistencies in black levels do hold back the overall image. Still, this is a solid transfer that has moments of greatness. Provided with an uncompressed Linear PCM Japanese Mono track with English subtitle options, 'Pale Flower' sounds about as good as you'd expect a mono track from the sixties to sound. Dialogue is clean but can sound a little thin and sharp at times. Dynamic range is flat and there is no real bass to speak of. Balance within the single channel is good and the film's impressive sound design and inventive score shine through the limited but authentic presentation. Overall, though certainly not impressive, the mono audio track represents the film well and gets the job done while respecting the original sound mixing. Criterion has provided a pretty slim assortment of supplements, but what we do get is certainly worth a look. All extras are provided in 1080p in Dolby Digital Mono with optional English subtitles. A booklet featuring an essay by film critic Chuck Stephens is also included in the package. Masahiro Shinoda Interview (HD, 21 min) - This is an interesting in depth interview with director Masahiro Shinoda discussing various aspects of the film's production. Footage from the film and some behind the scenes stills are edited in throughout. Shinoda comes across as very knowledgeable and friendly and touches upon many topics, including the development of the story, its parallels to Cold War era Japanese culture, the film's unique sound design and score, and some creative clashes with the studio. Selected-Scene Audio Commentary - Film scholar Peter Grilli provides audio commentary to a few select scenes from the movie. The scenes discussed are Prologue, The Clocks, Big Game, Muraki's Nightmare, and Sacrifice. All are viewable separately or together in one chunk. Grilli's comments are mainly geared toward discussing Toru Takemitsu's innovative and very hands on approach to music composition and sound design. While more information on other aspects of the film's production would have been welcomed, Grilli's music focused insights are certainly worth a listen. Theatrical Trailer (HD) - The film's theatrical trailer. Masahiro Shinoda's 'Pale Flower' is a solid take on noir conventions, one that features some impressive visual compositions and unique sound design. While its story doesn't quite achieve the kind of impact it strives for, there is still a lot to admire in the craftsmanship on display here. The video and audio presentations are both solid, and though slim, the extras provided are insightful. Definitely worth a look.